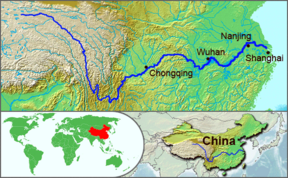 The Yangtze River or Chang Jiang (Simplified Chinese: 长江; Traditional Chinese: 長江; pinyin: Cháng Jiāng) is the longest river in Asia and the third longest in the world, after the Nile in Africa, and the Amazon in South America. 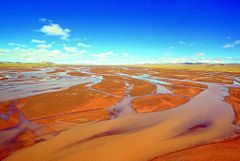 The river is about 3,964 miles (6,380 km) long and flows from its source in a glacier in Qinghai Province, eastwards into the East China Sea at Shanghai, receiving water from over 700 tributaries along the way. It has traditionally been considered a dividing line between North and South China, although geographers consider the Qinling-Huai River line to be the official line of geographical division. The Yangtze is one of the world's busiest waterways, flanked with industrial belts and high-tech development zones, and is a major transportation artery for China, connecting the interior with the coast. Cargo transportation on the river reached 795 million tons in 2005. Rapid modernization and economic development has accelerated problems such as industrial pollution, erosion and deforestation, and is accelerating the loss of native species. The Three Gorges Dam, officially opened in May, 2006, is the largest hydroelectric power dam in the world. It was conceived as a means of controlling floods, improving shipping, and providing electricity to millions of people, but may cause serious damage to the economy and the environmental health of the region. The name Yangtze River and various similar names such as Yangtse River, Yangzi River, and Yangtze Kiang are derived from Yangzi Jiang (Simplified Chinese: 扬子江; Traditional Chinese: 揚子江; pinyin: Yángzǐ Jiāng) listen ▶, which, beginning in the Sui Dynasty, was the Chinese name for the river in its lower reaches, specifically, the stretch between Yangzhou (扬州) and Zhenjiang (镇江). The name derives from the ancient ferry crossing Yangzi Jin (扬子津, meaning "Yangzi Crossing"). From the Ming dynasty, the name was sometimes written 洋子 (yángzĭ). Because it was the name first heard by missionaries and traders, this name was applied in English to the entire river. In Chinese, Yangzi Jiang is considered a historical or poetic name for the river. The modern Chinese name, Chang Jiang (长江/長江 Cháng Jiāng), literally means "long river" and may sometimes also be used in English. Like many rivers, the river is known by different names over its course. At its source it is called in Chinese the Dangqu (当曲, from the Tibetan for "marsh river"). Downstream it is called the Tuotuo River (沱沱河) and then the Tongtian River (通天河, "Pass to Heaven River"). Where it runs through deep gorges parallel to the Mekong and the Salween before emerging onto the plains of Sichuan, it is known as the Jinsha River (金沙江 Jīnshā Jiāng, "Golden Sands River"). The Yangtze was earlier known to the Chinese as simply Jiang (江 Jiāng), which has become a generic name meaning "river," or the Da Jiang (大江 Dà Jiāng, "Great River"). The Tibetan name for the river is Drichu (Tibetan: འབྲི་ཆུ་; Wylie: 'bri chu, "River of the Female Yak"). The Yangtze is sometimes referred to as the Golden Waterway. The river originates in a glacier in the Dangla Mountains on the eastern part of the Tibetan plateau. It runs through the eastern part of Qinghai, turning southward down a deep valley at the border of Sichuan and Tibet to reach Yunnan. In the course of this valley, the river's elevation drops from above 16,404 ft (5,000 m) to less than 3,281 ft (1000 m). It enters the basin of Sichuan at Yibin. 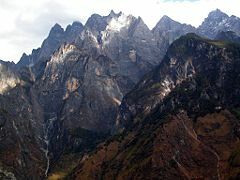 While in the Sichuan basin it receives several mighty tributaries, increasing its water volume significantly. It then cuts through Mount Wushan, bordering Chongqing and Hubei, to create the famous Three Gorges. Eastward of the Three Gorges, Yichang is the first city on the Yangtze Plain. After entering Hubei, the Yangtze receives more water from thousands of lakes. The largest of these lakes is Dongting Lake, which is located on the border of Hunan and Hubei provinces, and is the outlet for most of the rivers in Hunan. At Wuhan it receives its biggest tributary, the Han River, bringing water from its northern basin as far as Shaanxi. At the northern tip of Jiangxi, Lake Boyang, the biggest lake in China, merges into the river. The river then runs through Anhui and Jiangsu provinces, receiving more water from innumerable smaller lakes and rivers, and finally reaches the East China Sea at Shanghai. Four of China's five main freshwater lakes contribute their waters to the Yangtze River. Traditionally, the upstream part of the Yangtze River refers to the section from Yibin to Yichang; the middle part refers to the section from Yichang to Hukou, where Boyang Lake meets the river; the downstream part is from Hukou to Shanghai. 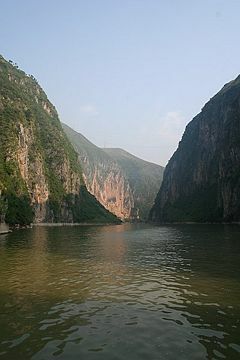 The Yangtze river is important to the cultural origins of southern China. Evidence of human activity dataing as far back as sevn thousand years has been found in the Three Gorges area, initiating debate over the origin of the Chinese people. In the Spring and Autumn Period, Ba and Shu were located on the western part of the river, covering modern Sichuan, Chongqing, and western Hubei; Chu was located on the central part of the river, corresponding to Hubei, Hunan, Jiangxi, and southern Anhui. Wu and Yue were located on the eastern part of the river, now Jiangsu, Zhejiang, and Shanghai. Although the Yellow River region was richer and more developed at that time, the milder climate and more peaceful environment made the Yangtze river area more suitable for agriculture. From the Han Dynasty, the region of the Yangtze river became increasingly important to China's economy. The establishment of irrigation systems (the most famous one is Dujiangyan, northwest of Chengdu, built during the Warring States period) made agriculture very stable and productive. Early in the Qing Dynasty, the region called "Jiangnan" (that includes the southern part of Jiangsu, the northern part of Zhejiang, and the southeastern part of Anhui) provided 1/3-1/2 of the nation's revenue. Historically, the Yangtze became the political boundary between north China and south China several times because of the difficulty of crossing the river. Many battles took place along the river; the most famous was the Battle of Red Cliffs in 208 C.E., during the Three Kingdoms period. Politically, Nanjing was the capital of China several times, although it usually dominated only the southeastern part of China, such as the Wu kingdom during the Three Kingdoms period, the Eastern Jin Dynasty, and smaller countries in the Northern and Southern Dynasties and Five Dynasties and Ten Kingdoms periods. Only the Ming dominated most parts of China from its capital at Nanjing, though it later moved the capital to Beijing. The Republic of China capital was located in Nanjing during the periods 1911-1912, 1927-1937, 1945-1949. The Yangtze is flanked with metallurgical, power, chemical, auto, building material and machinery industrial belts, and high-tech development zones. It plays an increasingly crucial role in the river valley's economic growth and has become a vital link for international shipping to the inland provinces. The river is a major transportation artery for China, connecting the interior with the coast. The river is one of the world's busiest waterways. Traffic includes commercial traffic transporting bulk goods such as coal, as well as manufactured goods and passengers. Cargo transportation reached 795 million tons in 2005. As the tourism industry grows in China, luxury cruises on the river lasting several days are becoming popular, especially through the beautiful and scenic Three Gorges area. Flooding along the river has been a major problem. 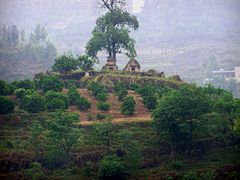 The rainy season in China is May and June in areas south of Yangtze River, and July and August in areas north of it. The huge river system receives water both from southern and northern flanks, which causes its flood season to extend from May to August. The relatively dense populations of the prosperous cities along the river make the floods more deadly and costly. The most recent major floods were the 1998 Yangtze River Floods, but more disastrous were the 1954 Yangtze river floods, which killed around 30,000 people. Other severe floods included those of 1911 which killed around 100,000, 1931 (145,000 dead), and 1935 (142,000 dead). Ships on the Yangtze at dawn with bridge in the distance (near Nantong). Pollution and heavy shipping traffic on the Yangtze have taken a heavy toll on native species. The Yangtze is home to (at least) two critically endangered species, the Chinese Alligator and the Chinese Paddlefish. In December of 2006, the Baiji Chinese River Dolphin was declared extinct after an extensive search of the river revealed no signs of the dolphin's inhabitance. In 2007, fears were expressed that China's Finless Porpoise, known locally as the jiangzhu or "river pig," might follow the baiji into extinction, and calls were made for action to be taken to save the porpoise. About 1,400 porpoises are left; between 700 and 900 in the Yangtze, and another 500 in Poyang and Dongting Lakes. The porpoise population is dropping at a rate of 7.3 percent per year, and 2007 numbers are less than half of the number counted in 1997. About 30 percent of river's major tributaries, such as Minjiang, Tuojiang, Xiangjiang, and Huangpu, are heavily polluted by massive quantities of ammonia, nitrogen, phosphorous, and other chemicals which have caused a significant reduction of the fish catch. The Yangtze is particularly polluted in Hubei (Shashi). The Three Gorges Dam across the Yangtze River was officially opened in May of 2006. As of 2007, it is the largest hydroelectric river dam in the world. When completed, the project will flood 632 square kilometers (395 square miles) of land to create a reservoir about 644 kilometers (400 miles) long by 112 kilometers (70 miles) wide. The total electric generating capacity will reach 22,500 MW when it is completed. The installation of ship locks is intended to increase river shipping from 10 million to 50 million tonnes annually, with transportation costs cut by 30 to 37 percent. Shipping will become safer, since the gorges are notoriously dangerous to navigate. The completion of the Three Gorges Dam project is expected to have a major impact on the Yangtze River basin. The Yangtze flows into the East China Sea, and was navigable by ocean-going vessels up to a thousand miles from its mouth even before the Three Gorges Dam was built. 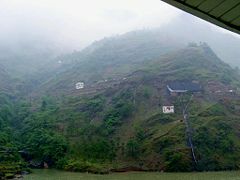 The dam spanned the river in June 2003, flooding Fengjie, the first of a number of towns affected by the massive flood-control and power-generation project. Over 1.4 million people have been relocated from the flooded areas to new settlements, the largest permanent relocation in human history. Chinese state media have announced that under a development plan of Chongqing province, an additional 4,000,000 people will be encouraged to move from their homes near the dam to the Chongqing metropolitan by the year 2020. This is the largest comprehensive irrigation project in the world, and has a significant impact on the China's agriculture. Its proponents argue that it will protect people living along the river from floods that have repeatedly threatened them in the past, and will offer them electricity and water transport, though at the expense of permanently flooding many existing towns (including numerous ancient cultural relics) and causing large-scale changes in the local ecology. Opponents of the dam point out that there are three different kinds of floods on the Yangtze River: floods which originate in the upper reaches, floods which originate in the lower reaches, and floods along the entire length of the river. They argue that the Three Gorges dam will actually make flooding in the upper reaches worse and have little or no impact on floods which originate in the lower reaches. Twelve-hundred years of low water marks on the river were recorded in the inscriptions and the carvings of carp at Baiheliang, now submerged. The Yangtze at the "First Bridge" of the Qingzang railway in Tibet. Cheung Kong Holdings, from the Cantonese language form of Chang Jiang and named after the river, is the name of the holding company controlled by Li Ka-Shing, one of Asia's richest tycoons. In 2004, Martin Strel from Slovenia swam the river from the Tiger Leaping Gorge to Shanghai (4600 km, 2860 miles). In 1342, the Yangtze River in Jiangzu province was reported to have run dry. Water completely disappeared for a day and the riverbed became visible. This event occurred again on January 13, 1954. ↑ Early Homo and associated artefacts from Asia, Nature Publishing Group, 1995. Retrieved March 14, 2008. ↑ Yangtze River's shipping capacity expands, Xinhua News Agency, 2006. Retrieved March 14, 2008. 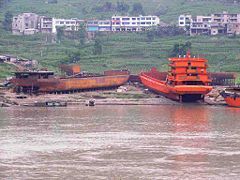 ↑ Cargo transportation along Yangtze River gathers speed, Xinhua News Agency, 2006. ↑ Poyang Lake saving the finless porpoise, www.chinadialogue.net. Retrieved October 23, 2007. ↑ Heavy pollution of river Yangtze, World ecological problems. Retrieved October 23, 2007. ↑ China's Three Gorges Dam to begin flood control with a bang (2006-05-29). Retrieved 2007-10-14. ↑ "Three Gorges Dam", UNEP, 20 May 2006. Retrieved 2007-05-27. ↑ "China's Three Gorges Dam Under Fire", Time, October 12, 2007.. Retrieved October 23, 2007. ↑ China dam to displace millions more, MWC.News Network. Retrieved October 23, 2007. ↑ Mary Ann Toy, The Age AU, "Three Gorges Dam 'could be huge disaster'", October 13, 2007, retrieved October 13, 2007. ↑ According to p. 140 of the 986th edition of Australian Chinese Daily magazine published on August 18, 2007. ↑ Exploring the Rivers of Tibet and China, Yangtze River, Earth Science Expeditions. Retrieved October 22, 2007. This page was last modified on 30 July 2013, at 21:06.